Port A Jetty is delivering up some nice Bull Redfish this time of year. De Francis visiting from Amarillo Texas sent in this awesome picture of a 44" bull redfish which was his personal best ever!.Caught on 9/23/2010. Cookie Vela caught a nice 26 inch black drum at the Port A Jetty using mullet. 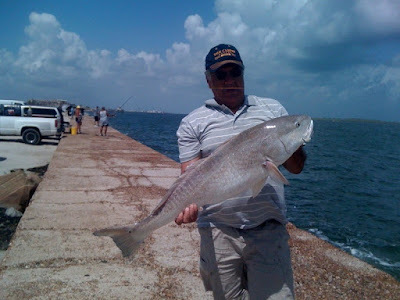 Cookie from Corpus Christi Texas enjoy's fishing the jetty's for bull redfish and had caught several bulls reds and released them prior to my arrival. 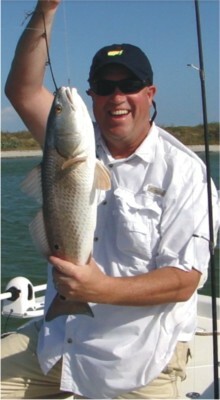 Cookie decided to catch a nice 43" Bull Redfish while I was there hiking the bolders of the Port A Jetty. Very nice catch and release of this beauty. That had been his 6th one of the afternoon. The Bulls are runnin at the Port A Jetty where Roland Morales caught a nice 35" redfish using live mullet. 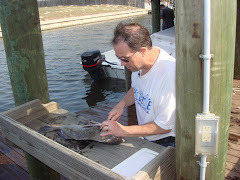 Roland visiting from San Antonio Texas enjoying the afternoon and tagging his prize for the day. 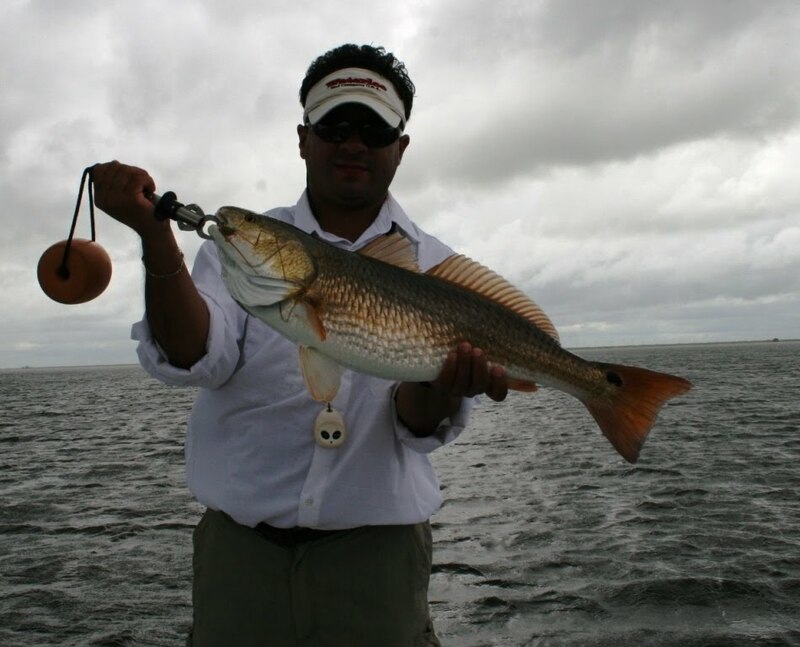 Mike Mata and Troy Morgan caught some nice slot redfish at the Packery Channel using live mullet. Both live close by in Corpus Christi and took advantage of the break in the rain. Still windy and choppy water but the made the most of it. I was traveling this past Thursday and didn't return till late Sunday evening. I spent the weekend at a cabin down on the Land Cut fishing Nine Mile Hole and Middle Ground with some good friends. It wasn't the best weekend to be down there obviously, but we did manage to find some very nice redfish in locations that are normally above the water line. 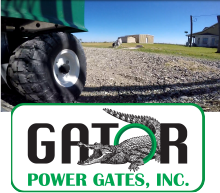 It's a weird deal running and fishing in areas that are normally considered land. We had both wind and rain in every direction with occassional slack wind. There were lot's of red fish in the North end of Nine Mile going into Mud Flats and Middle Ground. We chased several big schools that seemed to be very good at staying just outside our casting distance. The majority of our fish were sight-casted, but we did manage several fish blind-casting during the rains. We ended up boxing some nice trout in the 16 to 18" range as well. I'm looking forward to normal tide patterns and cooler temps...the redfish fishing should be outstanding.